Milwaukee, WI – Celebrate 30 years of local LGBTQ triumph with FREE ADMISSION to PrideFest Milwaukee! Each year, PrideFest Milwaukee is the official kickoff to Milwaukee’s summer festival season. To honor our history and heritage, Milwaukee Pride, Inc. is offering complimentary admission for all visitors from 2:30 p.m. to 4:30 p.m. on Friday, June 9. 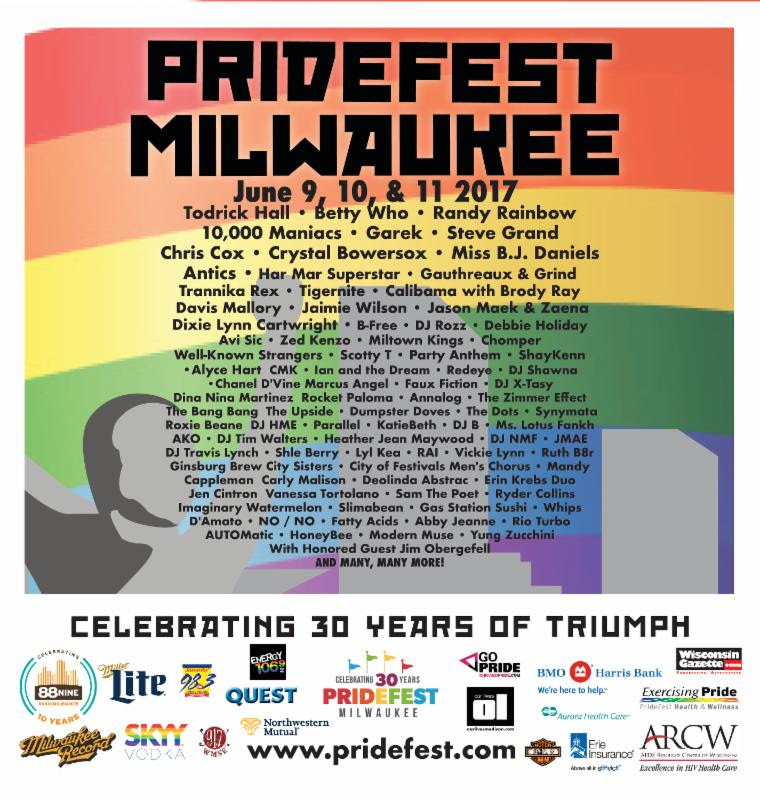 PrideFest Milwaukee 2017 features headliners Betty Who, 10,000 Maniacs, Steve Grand and Todrick Hall, along with over 150 diverse acts on eight stages to Henry W. Maier Festival Park on June 9, 10 and 11. Randy Rainbow, political commentator, will serve as Master of Ceremonies for the weekend. We are excited to welcome activist Jim Obergefell as our keynote speaker. In 2015, Obergefell’s landmark Supreme Court case resulted in a national victory for marriage equality. As a purposeful activist, Obergefell is dedicated to the fight for equality not just for the LGBTQ community, but for civil rights for all. He encourages and empowers audiences to stand by their beliefs — and prove that love always wins. We also recognize Keiana James with our Valor Award, which celebrates an individual who has fought to advance a critical community cause despite great resistance, obstacle or adversity. We honor and welcome our PrideFest Plus One beneficiary, GSAFE. The national anthem will be performed by local artist Corky Morgan. Please join us in celebrating these community heroes – and launching an exciting weekend of friends, family and fun at PrideFest Milwaukee 2017! Opening ceremonies begin at 3:00 p.m. sharp in the PrideFest Milwaukee Dance Pavilion and will end at 4:00 p.m. Reentry hand stamps will only be offered between 4:00 p.m. and 9:00 p.m. Three-day weekend passes to PrideFest Milwaukee 2017 include access to all shows, on all stages, all weekend long. Buy now for just $35 through June 8. Single day and VIP tickets are also available. Don’t forget to Give Plus One (or any dollar amount) to protect and support LGBTQ students through GSAFE. Your dollars will make an immediate impact in the local community.